In an effort to simplify the whole credit report shebang and provide a starting point, here’s some advice I posted on LifeHacker.com earlier today. What about your credit report? It’s out there and you’re wondering what it looks like and how it will appear to a prospective Lender. Maybe you’re preparing for the big home purchase sometime next year and you want to have all your ducks in a row. Perhaps you’re worried about identity theft or you’ve had problems in the past because your Dad, whose first and last names you share, has credit accounts appearing on your report. Or you’re just getting started building a credit history. Whatever the reason, you want to know and you want to know now. And, once you know what your report looks like, what do you do to correct mistakes or increase your score? The latest fashion seems to be for consumers to focus tremendous amounts of time and energy checking and protecting their credit history. Franky, I think all this energy being expended on credit reports is nonsense, but what do I know? I’ve only been looking at them for seventeen years! 4. If you have superb credit, consider opening a credit card with a bank based in the state of Arkansas. The reason most credit card companies base their operations in either Delaware or South Dakota is the law does not provide for an interest rate cap. Arkansas has a very reasonable cap, which in the 16 years I’ve known about it, has made credit cards from that state the best deal around. Once you’ve got an Arkansas credit card, transfer your balances from thos Delaware and S.D. cards and begin saving money on interest! 6. I think the subscription services provided by the credit bureaus is a waste of money and time. You really don’t need to be alerted every month about your credit report. If you pay your bills on time, use your credit wisely, then you really shouldn’t need to worry about your credit score because it will be excellent. 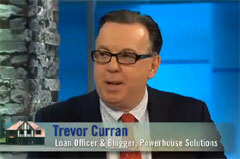 You can access these websites directly from my homepage, tcurranmortgage.com on the “Links” page. You need to know something about mortgage people and credit reports. We cannot thoroughly qualify anyone for a mortgage loan without a credit report in front of us. And that credit report must be provided within the company we are working for. We use a Tri-Merge report with reporting from all three credit bureaus provided by a company called Credco. Other mortgage companies and banks use a wide variety of other types of reports and various other service providers to access those reports. Is it possible for me to look at another mortgage company’s report to qualify? Yes, and no. If you have a copy of such a report (and you’re not supposed to have one, only the score disclosures) then I can review that report and get a sense of your creditworthiness. But I cannot use that report to qualify you thoroughly. Why is that? Well, depending on the service provider the report may not be as complete as the report we use. More often, though, it’s a matter of age. Mostly, it’s because a Lender has underwriting requirements related to the reports used. So, no matter which way you look at it, if you are getting qualified for mortgage financing, people are going to run your credit. What you must watch out for are those people who say they won’t run your report. Or, worse, those people who say they’ll only run it once: only to have it run multiple times. To the first group there, remember that under Fair Credit Reporting Act, we can only run your credit report with your written permission. The New York State Banking Department requires we keep a log and a record of your signed authorization. Problem is many mortgage people run credit reports just on a verbal authorization. So, you’re on the phone with a loan rep. and he’s taking basic information about you to qualify you. He asks you for your social security number. They will run your credit if you give them the information. Later they’ll tell you not to let anyone else run your credit report because the inquiries will stack up and lower your credit score (partly true, mostly a bad sales gimmick). The second group of mortgage folks will tell you they will run your credit report. But only once. That may be true: it’s what I do when I qualify you (with your written, signed, permission). But, I work for a Direct Lender. I’m not shopping your loan with seven different Lenders. My underwriters review your ONE report and use that to prequalify you. When working with a mortgage broker, it’s different. What they don’t tell you is that when they’re shopping for your loan approval with different Lenders—this is typical of mortgage brokers, who don’t lend directly, they place your loan with a Lender—they send a basic application for you to the Lenders. This is part of the qualification process and there’s nothing wrong with that. When the Lender gets your application, guess what the Lender is going to do? Run your credit! Again! The more Lenders receive your application from the original mortgage broker, the more inquiries on your credit report. I recently tried to qualify a client for a refinance. He had been working with two different mortgage brokers for almost a year trying to refinance. His credit report had 67 inquiries within three months. His score was in the 400’s. He had decent credit, not great, but not bad enough to have such a low score. His low score was a direct result of all those inquiries. Guard your credit information. Try to suss out the mortgage people you want to work with before they run your credit report. Once you’re comfortable with that, then you can proceed to complete the qualification process. Because at the end of the day, no matter what, they’ll run your credit. types of credit reports we use to qualify you. report is used with credit scores. or Residential Mortgage Credit Report. all these phone calls is presented to the Lender in the report. respectively, we must refund the difference to you at closing. until you locate a property and engage to purchase the property. Credit repair and Settling a collection account for less than you owe. With a well-organized action plan, credit repair and settling collection accounts can be accomplished without much fuss. A friend has some heavy medical bills. While she was paying them, the hospital assigned the bills to a collection agency. This is not unusual in my experience with medical and dental bills, no matter the amount, large or small. She is planning on offering the collection agency half the balance in order to settle the debt. It’s a great strategy, but one that requires tenacity, and extreme diligence to confirm the terms of settlement are in your favor. She was thinking of calling them everyday. Best path to credit repair success is to put it in writing every 30 days. 30 days is the cycle mandated by FTC. Under Fair Credit Reporting Act, the credit bureau has 30 days to investigate your dispute. While investigating, the disputed account must be removed (this is the source of the scam-artists who charge for credit repair) from your report. In the investigation, the original creditor must PROVE the information. If they don’t, the item is removed permanently from your report. If they prove it again, the information goes back onto your report. You’ll get updated reports throughout the investigation period showing the disputed accounts and the status of same. 1. Always write down immediately the name of the rep. you’re speaking to. 2. Negotiate your settlement. Best tactic for this is to promise immediate, same day payment in return for favorable reduction of balance terms. Western Union QuickCollect or check by phone is best method of payment. 3. Once the rep. agrees, condition your payment upon a written confirmation via fax of the terms agreed upon. You want a fax because you want a signature on that letter. The letter should indicate the settled balance, date of payment, and that this payment settles the account completely and no further collection activity will be taken. 4. When you have the letter of confirmation in hand, and it’s correct, send your payment immediately. You’ll receive a satisfaction letter indicating that all three credit bureaus have been updated to show this account as paid and settled for less than full balance. Confusing Credit Issues: to pay in full or not to pay in full? There is general confusion regarding the issue of paying credit card balances in full every month. Sure, avoiding fees and interest is a great concept, but there’s more to the story. In the mortgage industry, when we review a credit report, our loan decisions are not based solely on the score. We actually read the report. We want to see that an applicant actually uses the credit available to her. If an applicant is in the habit of sporadically using credit, and then paying the balance in full when she does, then her report—while it may have a good score—may reflect this lack of use of the accounts. We get a bit skittish when we see that. You might say, “But if I show I use my credit conservatively isn’t that good for the bank? It means I have more resources to pay my mortgage, thus I’m a good risk.” While that’s perfectly logical thinking, you must remember we are rating your entire set of qualifications based on the risk factors for making a loan to you. Therefore, we really do want to see that you use your credit on a consistent basis (and you pay on time, of course). If you use your card(s) every month, paying them in full as you go, then this isn’t really an issue because we’ll see the activity. It’s those big holes of several months at a time when you don’t use credit that you want to watch for. That all having been said, truly the only time you want to “worry” about your credit scores and this crazy useage issue is when you are planning on buying a home or a car. Since those are two big purchases, you want to have all your ducks in a row. Otherwise, worrying about your score all the time is a waste of time. Your score will always be good if you pay your bills on time, use your credit wisely and conservatively, and in general maintain an even keel in your credit life. If you go to my “Links” page, there’s a link to MYFICO.com which explains how credit scores are determined. There are also other good resources there regarding credit.